Venus and Serena (right) were winning the Australian Open doubles title for the fourth time. (CNN) -- Serena Williams warmed up for her women's singles final clash with Justine Henin by teaming with sister Venus to win the Australian Open doubles crown in Melbourne on Friday. The combined to beat top seeds Cara Black and Liezel Huber 6-4 6-3 for their fourth Australian Open title, defending the crown they claimed last year. Serena will be hoping she can repeat last year's success at the opening grand slam of the season as she later thrashed Dinara Safina of Russia to claim the singles title. She faces former world number one Henin on Saturday on the Rod Laver Arena after the pair came through semifinal matches against Chinese opposition on Thursday. "I look forward to more titles," Serena said after claiming a grand slam doubles title for the 11th time with Venus. She is hoping for a 12th in singles against Henin to tie fellow American Billie Jean King in the all-time list. The Williams sisters made the initial breakthrough against Huber's service to lead 4-3 in the opening set before Serena faced two break points in the next game but held. Black held service in the next game, leaving Venus to serve for the set which she did with the minimum of fuss. Huber was broken twice in the second set, including the crucial ninth game as the Williams sisters claimed the title with Serena's fine volley, sparking the customary high-five celebrations. 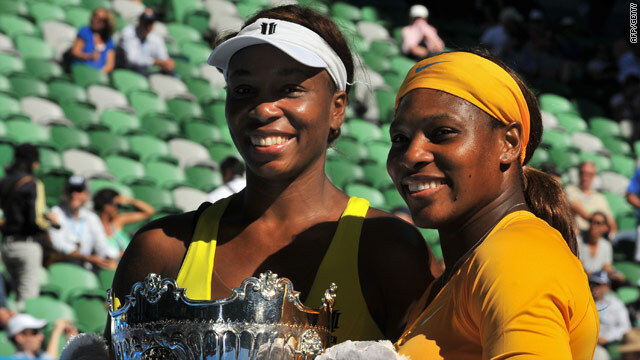 The Williams sisters have claimed doubles titles in Australia in 2001, 2003 and last year, with Black, who is from Zimbabwe, and South-African born Huber winning in 2007.